Building on one of its most successful seasons yet, the Bowdoin College nordic ski team, out of Brunswick, Maine, recently jumped back into training under the guidance of head coach Nathan Alsobrook. Last winter, three skiers qualified for NCAA Skiing Championships, one alumna qualified for the U.S. Olympic team (Kaitlynn Miller, class of 2014), and one visually impaired skier Jake Adicoff (’18) earned a silver medal at the Paralympics. It was a season that Alsobrook names as a highlight of his coaching career. 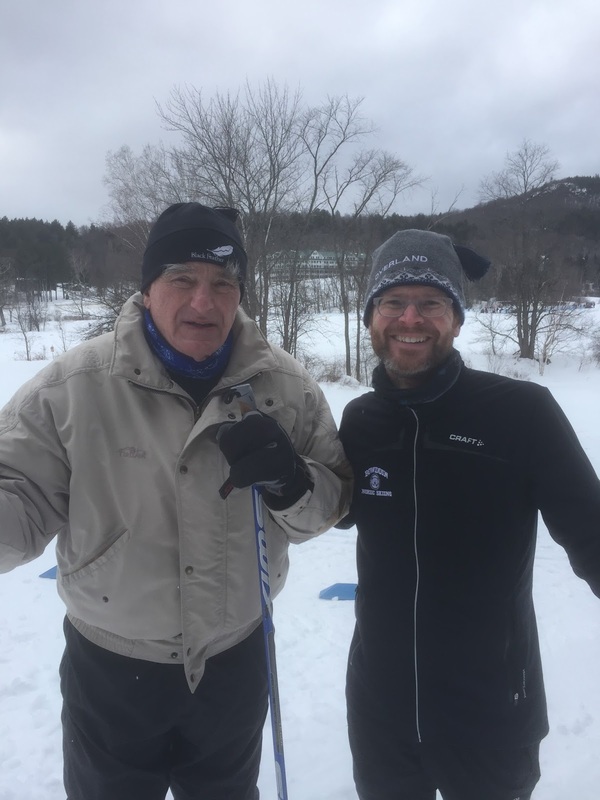 To top it off, Alsobrook was recognized by the New England Nordic Ski Association (NENSA) as 2018 Coach of the Year in recognition of his team’s steady progress and his contributions to the growth of cross-country skiing in New England. A Bowdoin graduate (’97) himself, Alsobrook returned as head coach in 2007, taking the place of former U.S. and Canadian national team coach Marty Hall, to whom he attributes planting the seeds for Bowdoin’s current development. Before Bowdoin, Alsobrook coached at Whitman College, Montana State University (MSU), Colby College, and the Pocatello XC Ski Foundation, and earned a master’s in exercise physiology from MSU in 2005. While it didn’t happen overnight, over the years, the Bowdoin Polar Bears have trended upward in the Eastern Intercollegiate Skiing Association (EISA) nordic rankings. 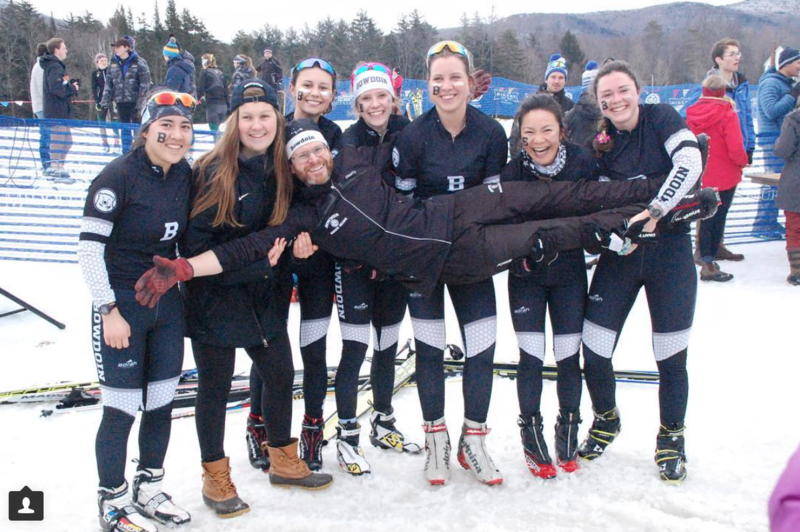 Every weekend on the Carnival circuit last winter, either Bowdoin’s men’s or women’s team placed in the top six. And it saw three skiers — more than ever before — qualify for NCAA’s in Steamboat Springs, Colorado: Gabrielle Vandendries, Renae Anderson and Elliot Ketchel. Outside of the results, Alsobrook said he enjoys the culture of the student body at Bowdoin and feels that it contributes to the dedication and work ethic of his athletes. “There is this really great sense of balance here at Bowdoin, and we really try to compliment that in our program,” he said. “It’s such a fun mix of these very academically focused and engaged students. … They just love learning, they love being in this environment and challenging themselves, and then they’re just so ready to get out and train hard. His coaching philosophy aims to capitalize on this dedication to personal success, while also reflecting the sense of balance achieved at the school. 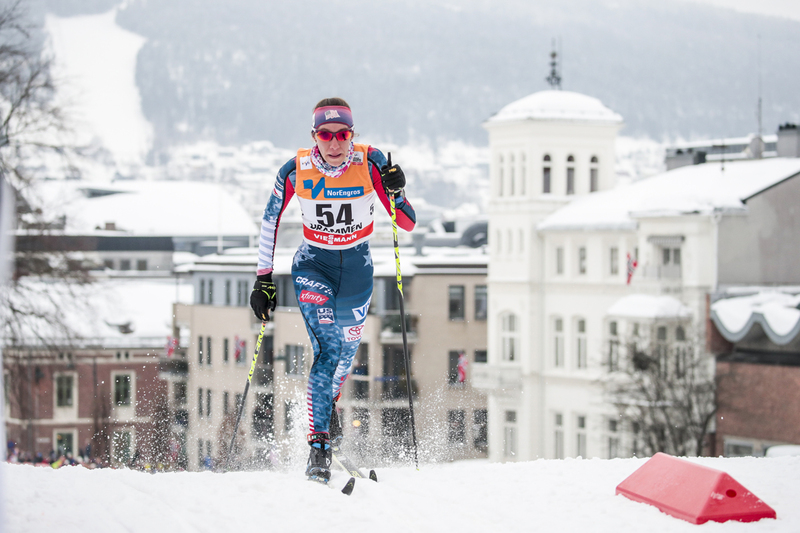 Miller ended last season as the overall SuperTour leader and has earned World Cup starts in November and December as a result. As for the upcoming season, Alsobrook will continue to focus on the continued growth of his team. “With my athletes, we’re all about the process,” he said. “Having said that, of course, I have outcome goals, essentially I want to see the team keep moving forward. We’ve never won the Maine State Championship, for example … so we’re really excited to go after that this year. We’ve come close a few times, and maybe this will be our year,” he said. Another goal will be to continue to place highly at EISA Carnivals and to develop a strong championship team. Last year, its two female athletes at NCAA’s — Vandendries and Anderson — posted top-30 finishes in Steamboat.